Brand: Orignal Bug Shirt Co. 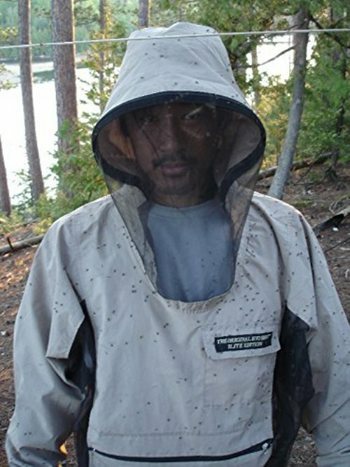 The Original Bug Shirt® "Elite Edition"
The loose fitting design and specialized materials used in the construction of all our protective clothing, not only prevent mosquito bites, and protect the wearer from black flies, no-see-ums, deer flies, horse flies, and ticks, but it can also reduce the risk of contracting the diseases these pests can carry, like Lyme Disease, West Nile virus, and Malaria. Color: Sandstone. The Original Bug Shirt® Elite Edition. We moved the zipper from the bottom edge of the face mesh to the top, and put two sliders on it. This way you can open it just a tiny bit (to look clearly through binoculars, take photos or eat!) without letting the biting insects get to you. Because we used one zipper with two sliders, and not two zippers, that means you get to choose where the opening will be - maybe top dead centre (great for binoculars) or on one side so you can sneak a snack into your mouth before the bugs notice! We added an adjusting cord to the back of the hood, so you can effectively pull the hood back off your face if it falls too far forward and blocks your peripheral vision. This means we can accommodate all manner of neck lengths! By using both these features together you can wear the shirt with your face exposed but the rest of you protected, as in the picture above - added versatility! We added a ribbed cuff, and still kept the elastic cord adjusters at the wrist. 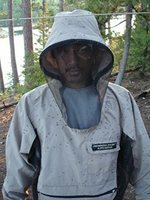 This way you get added comfort and maximum effectiveness at keeping blackflies, no-see-ums and ticks out, and still keep blood flowing to your hands! We put an additional patch pocket with a velcro closing flap on the front of the shirt. We modified the shape of the sleeve to wrap your elbow more completely and prevent mosquitoes from attacking at that tender spot. We moved the location of the drawcord lock at the waist slightly to the left. This was as a result of comments from users out in the wilderness who found the old location just too centred!